In May 1889 van Gogh checked into an insane asylum. This landscape belongs to a series of pictures based on the view from his barred window there. 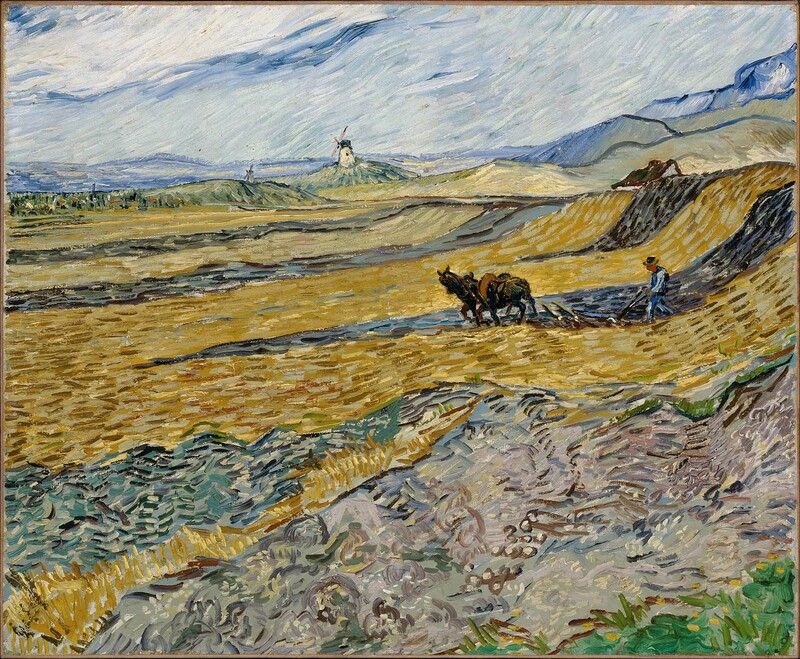 The scene is much as the artist described it in a letter to his brother, Theo, on August 30th: “…a field of yellow stubble that they are ploughing, the cut part of the ploughed earth with the strips of yellow stubble, background of hills.” The distant windmills, however, were an addition from van Gogh’s imagination, an indication that he painted the scene from memory several months later. In "Vincent van Gogh and Paul Cassirer, Berlin" (Zwolle, 1988), Walter Feilchenfeldt suggests the painting belonged to the artist's sister, Wilhelmina van Gogh. In a letter of January 24, 1992 (in MFA curatorial file), Mr. Feilchenfeldt reverses his opinion, suggesting that the picture was, rather, sold by Johanna van Gogh-Bonger in 1894-95, either to Emile Schuffenecker or to Julien Moline. Subsequently, in a letter of January 13, 2003 (in MFA curatorial file) he reintroduces the possibility that it was in Wilhelmina's possession. Letter from Guy-Patrice Dauberville, Bernheim-Jeune & Co. (March 20, 1992); it is not known when and how Josse and Gaston Bernheim-Jeune acquired the painting, nor when and how it left their possession. Walter Feilchenfeldt (letter of January 13, 2003; cited above, n. 1) has suggested that the painting may have acquired by the Bernheim-Jeune family as early as before the turn of the twentieth century. The gallery exhibited the work in 1904 and 1908, though it is not known who owned it at the time. Justice was a collector and art dealer. Madeleine Korn, "Collecting paintings by Van Gogh in Britain before the Second World War," Van Gogh Museum Journal, 2002, 134-35, cites a letter from A. J. McNeill Reid to Douglas Cooper (April 9, 1953) stating that Justice "went off to Bernheim-Jeune, got quite a few pictures on sale, bought a few more, and did a good deal of business with Boyd." Korn 2002 (as above, n. 3), 134-35, states that Justice sold this painting to Boyd. According to information provided by Frances Fowle, to be published in "Van Gogh and Britain: Pioneer Collectors" (Edinburgh, 2006), McNeill Reid commented in an earlier letter to Cooper (April 5, 1953) on "a couple of Van Goghs [Boyd] bought through Justice." Boyd lent the painting (then called "La Charrue" or "The Plow") to the "Loan Collection of Pictures, Centenary of the Norwich Museum" (Norwich Museum, October 24 - November 1, 1925), cat. no. 64 and to the Royal Scottish Academy (Edinburgh, 1929), cat. no. 354. However, Korn 2002 (as above, n. 3), 136, records the painting as being with C. E. Dix in 1928. She has suggested (verbally, December 14, 2005) that around this time it was with the dealer Arthur Tooth, implying that Tooth either sold it to or purchased it from Dix in 1928. This contradicts the evidence that Boyd owned it until at least 1929, and remains unconfirmed.